Scotland could face a £1.3billion Brexit budget bombshell if the chancellor cuts spending in an effort to balance the books. The Institute for Public Policy Research (IPPR) has warned the Scottish Government’s finances could be squeezed by more than £1billion a year by 2019/20 due to dwindling tax receipts and lower economic growth in the wake of the EU exit vote. The warning comes ahead of Philip Hammond’s first Autumn Statement as chancellor next week. Depending on his announcements, IPPR Scotland suggested the country’s budget will be cut by between £340million and £1.34billion per year by 2019/20. Around £2billion of cuts were already announced before the Brexit vote, meaning the total budget reduction for Scotland could be as high as £3.34billion at the end of the decade. SNP MSP Joan McAlpine, who chairs Holyrood’s Europe committee, said the figures showed the “Tory Brexiteers have blown a hole in their own budget”. The IPPR Scotland assessment is based on an earlier study by the Institute of Fiscal Studies (IFS), which warned lagging growth and higher inflation would leave the UK worse off by around £25billion by 2020. A spokesman for the UK Treasury said “significant progress” had been made in reducing public debt, but it still “remains too high”. But Ms McAlpine said: “The Tory Brexiteers have blown a hole in their own budget, with the IFS warning that slower growth and higher inflation will cost the UK Government £25bn by the end of this parliament. “But the chancellor has a choice over how he responds – and it would be a huge mistake to double-down on failing austerity. The figures from IPPR Scotland come after a Scottish Government analysis suggested Brexit could lower GDP north of the border by as much as £11.2billion per year by 2030. 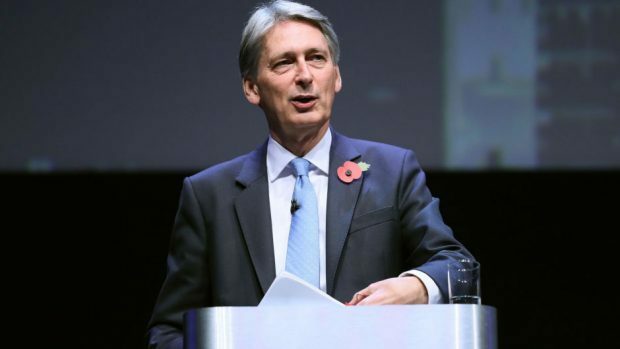 The think-tank’s analysis works on the assumption that Mr Hammond will have to balance the budget through a combination of tax rises and spending cuts – but there would be no effect to Scotland’s budget if the gap were to be made by borrowing alone. The IPPR Scotland report, which will be presented before Holyrood’s finance committee tomorrow, states: “Looking ahead to medium and long-term prospects it is clear the public spending challenges do not disappear. “We are likely to see public spending cuts that last into the next UK Parliament and Scottish Parliamentary terms. MSPs will today debate a motion calling for membership of the EU single market to be protected post-Brexit – a measure some argue would help alleviate the potentially negative effects of leaving the continental block. A Treasury spokesman said that while there had been “significant progress” in reducing public spending, “our debt and deficit remain too high”.